In calculus (a branch of mathematics), a differentiable function of one real variable is a function whose derivative exists at each point in its domain. 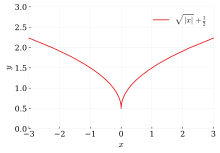 As a result, the graph of a differentiable function must have a (non-vertical) tangent line at each point in its domain, be relatively smooth, and cannot contain any breaks, bends, or cusps. More generally, if x0 is a point in the domain of a function f, then f is said to be differentiable at x0 if the derivative f ′(x0) exists. This means that the graph of f has a non-vertical tangent line at the point (x0, f(x0)). The function f may also be called locally linear at x0, as it can be well approximated by a linear function near this point. The absolute value function is continuous (i.e. it has no gaps). It is differentiable everywhere except at the point x = 0, where it makes a sharp turn as it crosses the y-axis. 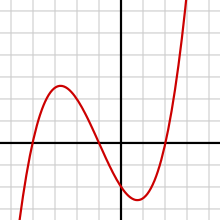 A cusp on the graph of a continuous function. At zero, the function is continuous but not differentiable. If f is differentiable at a point x0, then f must also be continuous at x0. In particular, any differentiable function must be continuous at every point in its domain. The converse does not hold: a continuous function need not be differentiable. 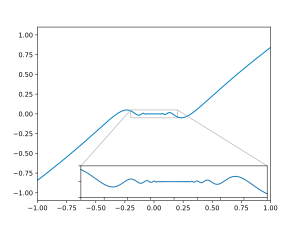 For example, a function with a bend, cusp, or vertical tangent may be continuous, but fails to be differentiable at the location of the anomaly. Most functions that occur in practice have derivatives at all points or at almost every point. However, a result of Stefan Banach states that the set of functions that have a derivative at some point is a meager set in the space of all continuous functions. Informally, this means that differentiable functions are very atypical among continuous functions. 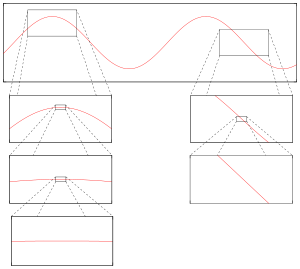 The first known example of a function that is continuous everywhere but differentiable nowhere is the Weierstrass function. Differentiable functions can be locally approximated by linear functions. is differentiable. However, this function is not continuously differentiable. which has no limit as x → 0. Nevertheless, Darboux's theorem implies that the derivative of any function satisfies the conclusion of the intermediate value theorem. Continuously differentiable functions are sometimes said to be of class C1. A function is of class C2 if the first and second derivative of the function both exist and are continuous. More generally, a function is said to be of class Ck if the first k derivatives f′(x), f′′(x), ..., f (k)(x) all exist and are continuous. If derivatives f (n) exist for all positive integers n, the function is smooth or equivalently, of class C∞. If a function is differentiable at x0, then all of the partial derivatives exist at x0, and the linear map J is given by the Jacobian matrix. A similar formulation of the higher-dimensional derivative is provided by the fundamental increment lemma found in single-variable calculus. If all the partial derivatives of a function exist in a neighborhood of a point x0 and are continuous at the point x0, then the function is differentiable at that point x0. is not differentiable at (0, 0), but again all of the partial derivatives and directional derivatives exist. , but it is not complex-differentiable at any point. Any function that is complex-differentiable in a neighborhood of a point is called holomorphic at that point. Such a function is necessarily infinitely differentiable, and in fact analytic. If M is a differentiable manifold, a real or complex-valued function f on M is said to be differentiable at a point p if it is differentiable with respect to some (or any) coordinate chart defined around p. More generally, if M and N are differentiable manifolds, a function f: M → N is said to be differentiable at a point p if it is differentiable with respect to some (or any) coordinate charts defined around p and f(p). ^ Banach, S. (1931). "Über die Baire'sche Kategorie gewisser Funktionenmengen". Studia. Math. 3 (1): 174–179. . Cited by Hewitt, E; Stromberg, K (1963). Real and abstract analysis. Springer-Verlag. Theorem 17.8.